This is a 11 cm x 12 cm reindeer leather coin purse that has been made from upcycled reindeer leather scraps. 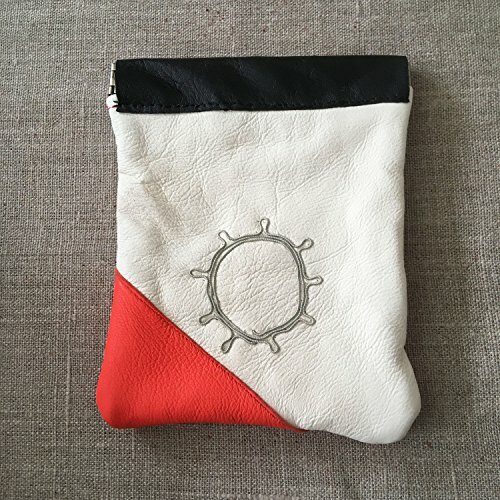 The little coin pouch has been embellished with hand stitched pewter thread in a traditional Saami Sun design. The mini coin wallet has a flex frame enclosure. The reindeer leather wallet is lined with cotton fabric that has been dyed with Madder Root natural dye. Each purse, pouch and handbag is different depending on the reindeer leather that I currently have on hand. If you would like to have a special reindeer leather bag made for you, please contact me regarding a custom order. Please allow 2-4 weeks for completion of custom orders. If you have any questions about this product by Paivatar Yarns US, contact us by completing and submitting the form below. If you are looking for a specif part number, please include it with your message.